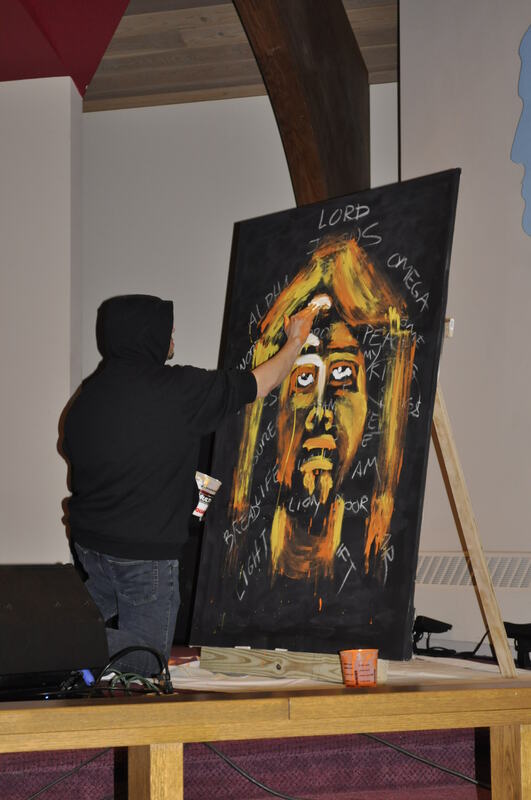 Last month, our church hosted a Youth Conference, entitled “Who Do You Think You Are?”Heidi and I had the privilege of being on the planning committee. 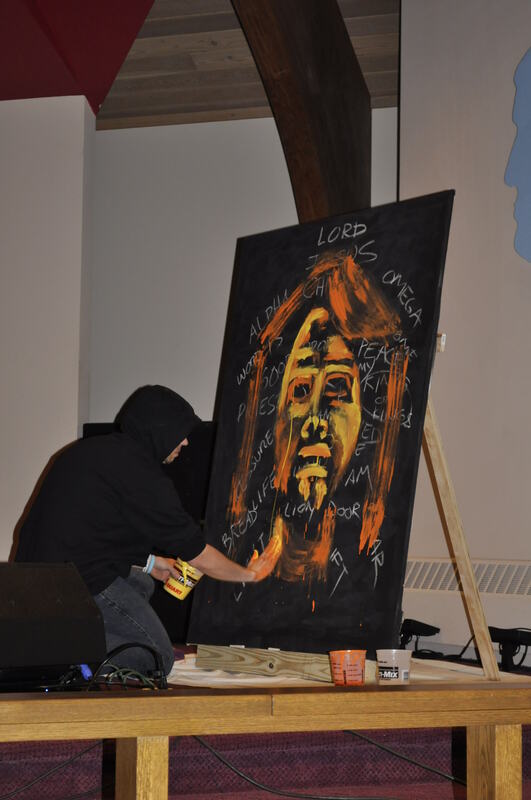 The three-day event focused on showing teens their true identity in Christ, compared to what they are consistently bombarded with on a daily basis from the media. It featured two key speakers and over 100 volunteers that helped throughout the weekend. Each night included worship music and small group sessions, with a Saturday evening that included a bonfire, basketball tournament, movie, and lots more. 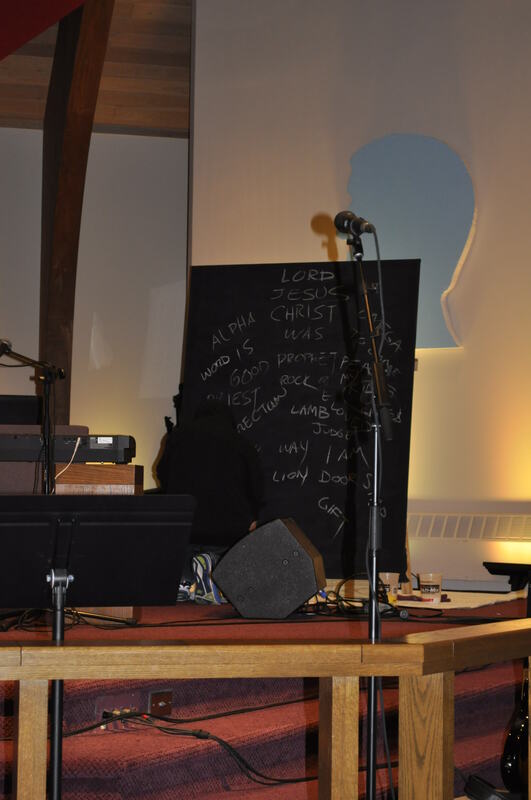 Sunday evening featured a family-night worship experience for parents and children of all ages. 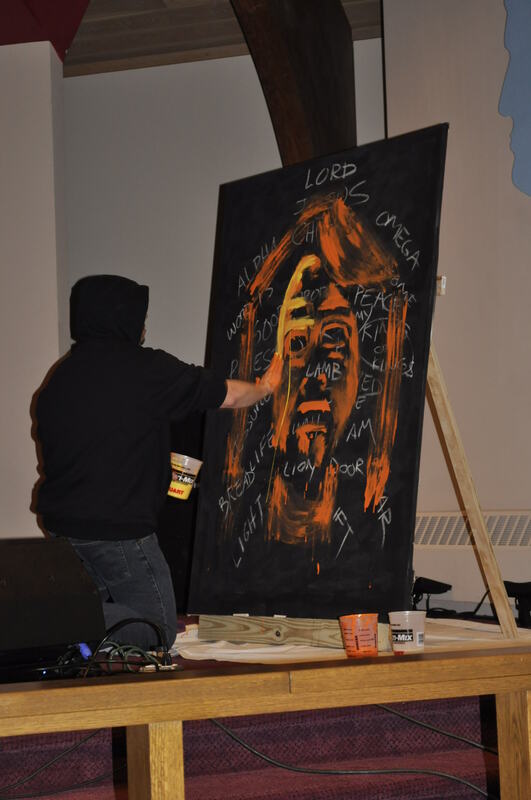 In the planning stages of the youth conference I was looking for unique ideas that could be shared during the Sunday evening family service that would be enjoyed by people of all ages, when I stumbled on a great idea on YouTube called “splat art”. 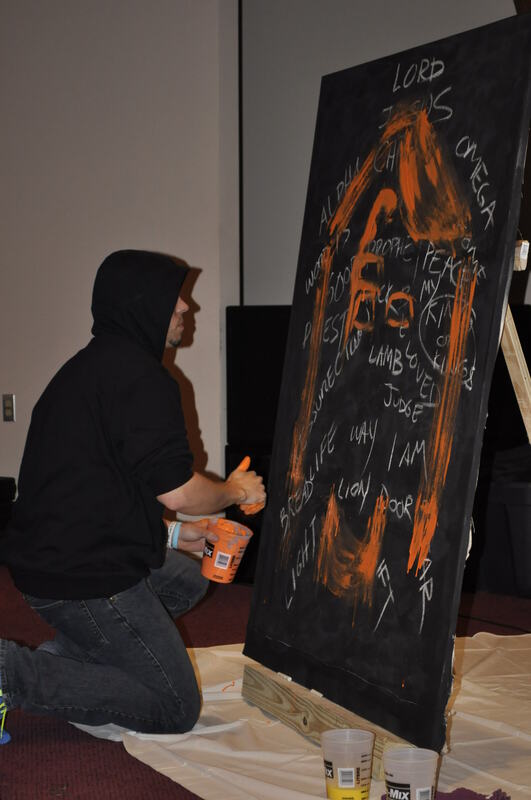 Splat art is a performance art that uses brushes or a performer’s hands to paint a picture on a canvas in a 5-10 minute time frame, usually accompanied by music or narration. I saw this done previously and it was absolutely breathtaking. I thought, what a great idea, this is perfect! After I looked at several examples I found one that really stuck out to me and I suggested to the committee the following week that we include it. When asked, “who we could get to do the performance?”, I said nervously “me”. I had thought to myself prior to the meeting, I think I can do this. I had prayed about it previously and felt a reassurance that I should do this, so I decided that, with enough time to practice, I might just be able to pull this off. Excitedly I went out to the store the very next day and purchased several small canvases to practice on a a few tubes of paint. The first step in the performance would be to memorize the beginning script of 30 words that are narrated to describe the many beautiful aspects of our Savior. I sat in the parking lot of a UPS store on the day we needed to renew our fingerprints for USCIS and ran through each of the words, sketching them out in order on a sheet of paper as I waited for Heidi to meet me on her way home from work. As we ate dinner that evening I sketched them out on a napkin and got about 80% of them correct. I practiced each day over the next week writing the words as I read the script until I had them memorized. The next part would prove to be the most rewarding, while most challenging part of the process. 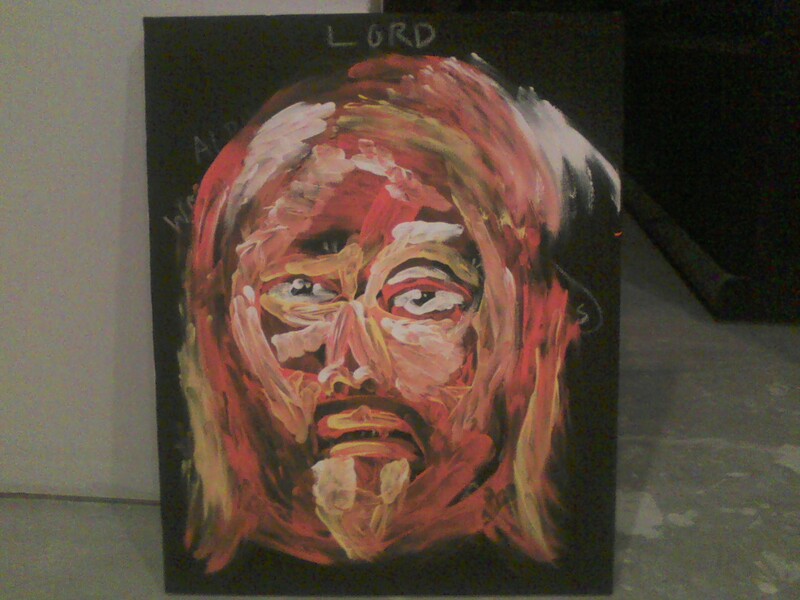 For the splat art performance, after writing the 30 words in the shape of Jesus face, I would need to use only my hands and 3 colors (orange, yellow, & white) to paint a portrait of Jesus that would measure 4 foot x 6 foot. 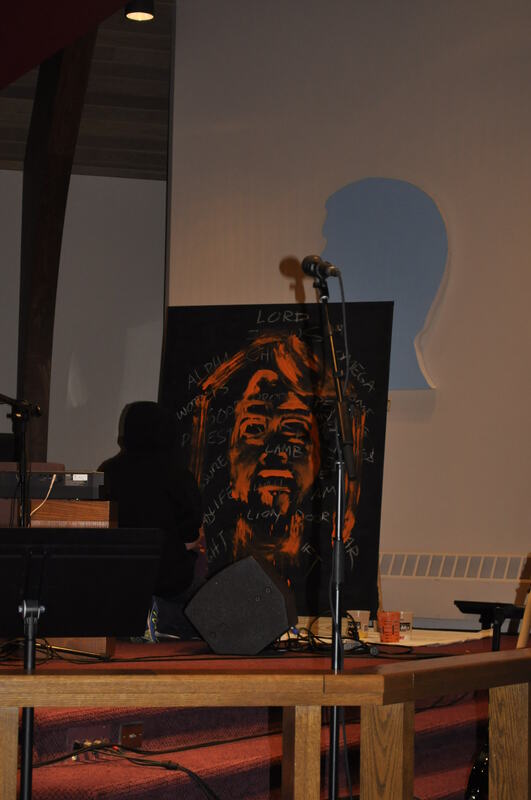 During the service, I would have approximately 8 to 10 minutes to complete the painting, including the 30 words. 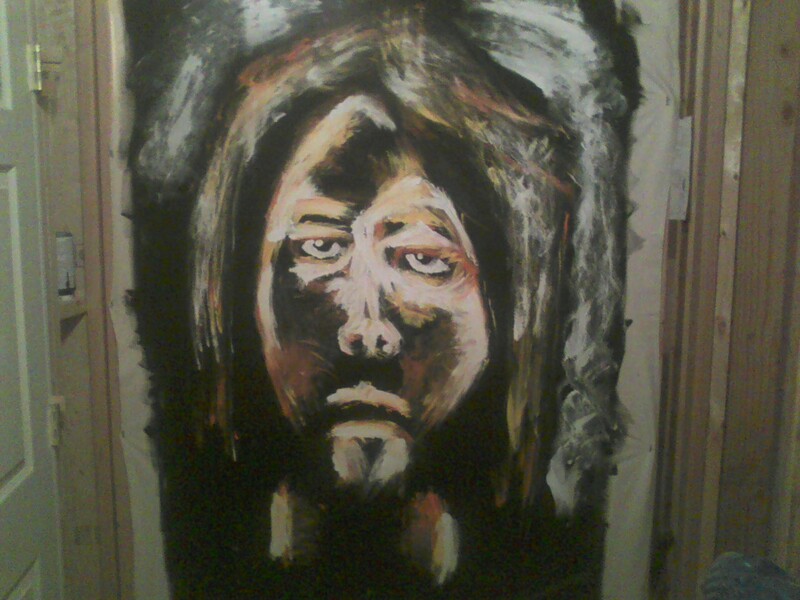 The first evening I painted my test canvases black and grabbed a stick of white chalk to write down the words. As I waited for the black paint to dry, I said a small prayer that God would allow me to be patient in learning this painting—realizing that it wouldn’t be an overnight process. I prayed that He would allow others to see His glory through me and that He would reveal Himself to me over the next 30 days. 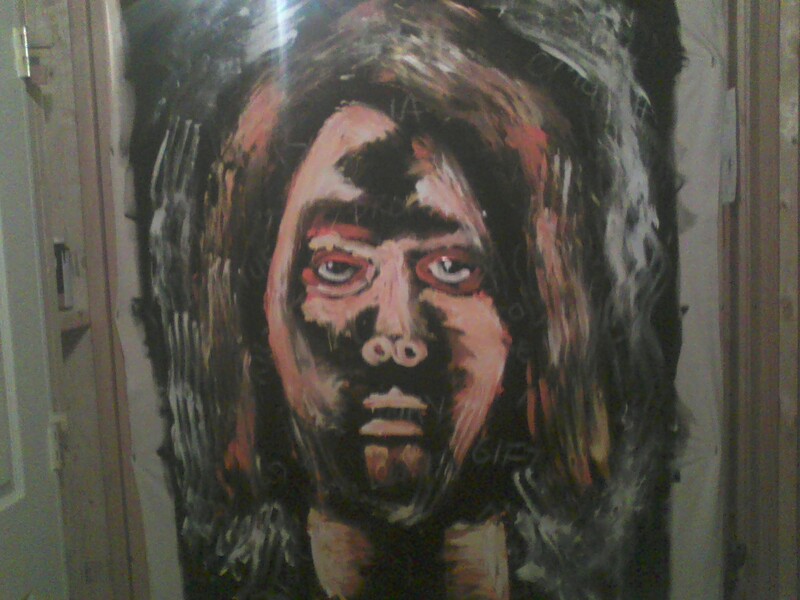 I poured out some paint on a plastic plate and begin to paint, looking at the screen shot that I had from the YouTube video I previously found. 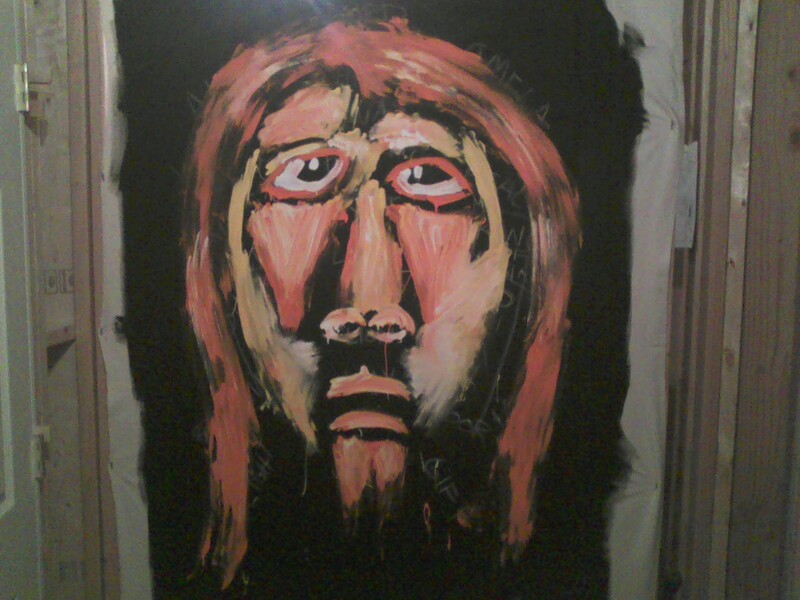 I got a majority of the words correct, but had difficulty in getting the painting portion down. I would go downstairs the following evening to try again. Once again beginning with a prayer and using the time as a true worship experience. 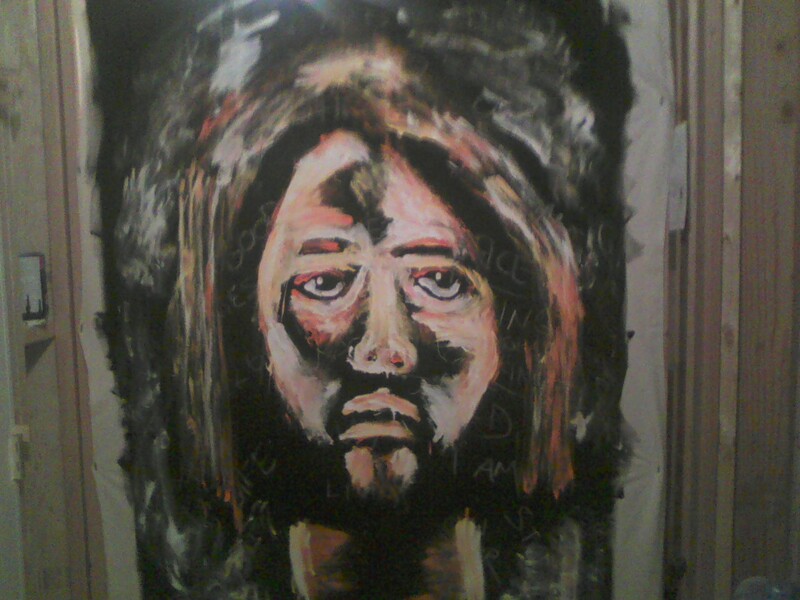 I played several praise & worship songs from my iPod and used the time to truly focus on not just painting, but the subject I was trying to glorify. I found that as I kept practicing each day, it was a different experience every time. Each day was led with prayer and was an opportunity for me to spend time during my day just focusing on what Jesus really meant to me. After several days of painting on smaller canvases, I realized that if I was going to learn this properly, I would need to move to a larger full-sized canvas and start working on the timing of narration and the music. I took a trip to Home Depot to pick up a canvas drop-cloth, some Gesso, and some staples and knew just where I could setup a make-shift studio. I spent the evening picking out songs and settled on a song that our youth often sing during the Wednesday night worship service entitled “Inside Out” by Hillsong. 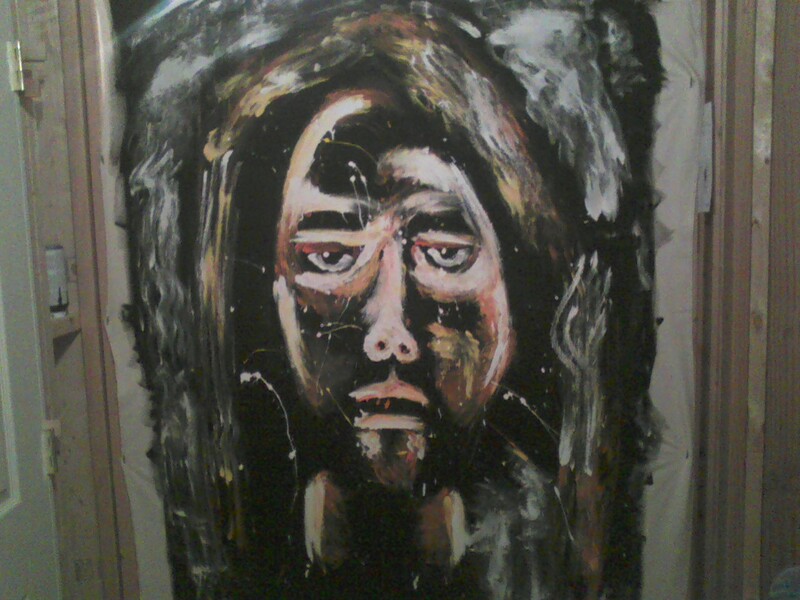 I found a live version on YouTube that I thought would be perfect for the performance as it allowed me a little extra time to complete the painting than the original song used in the original splat art performance I had found. The next morning I went downstairs before work and pulled up on my iPod the original performance I had found on YouTube. 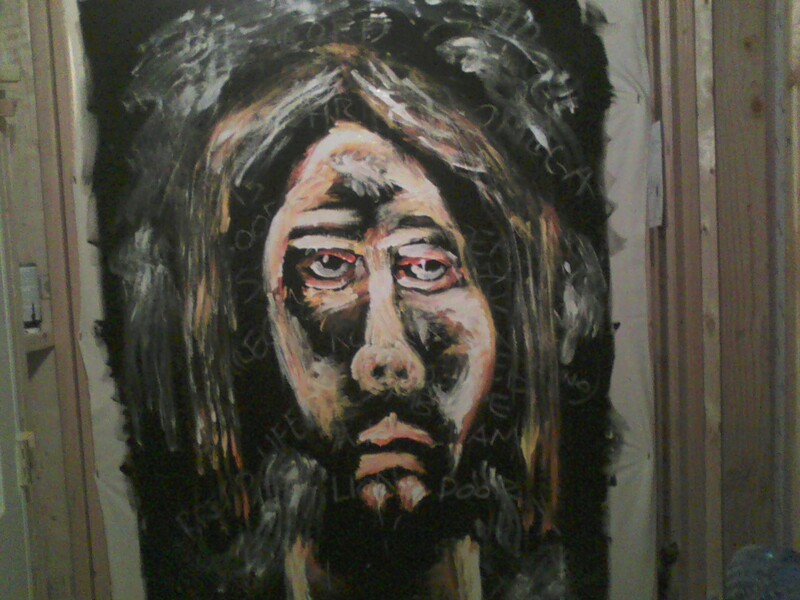 I began to write the words in unison with he narration and switched over to the Hillsong video for the painting portion. That morning was the most impactful yet. 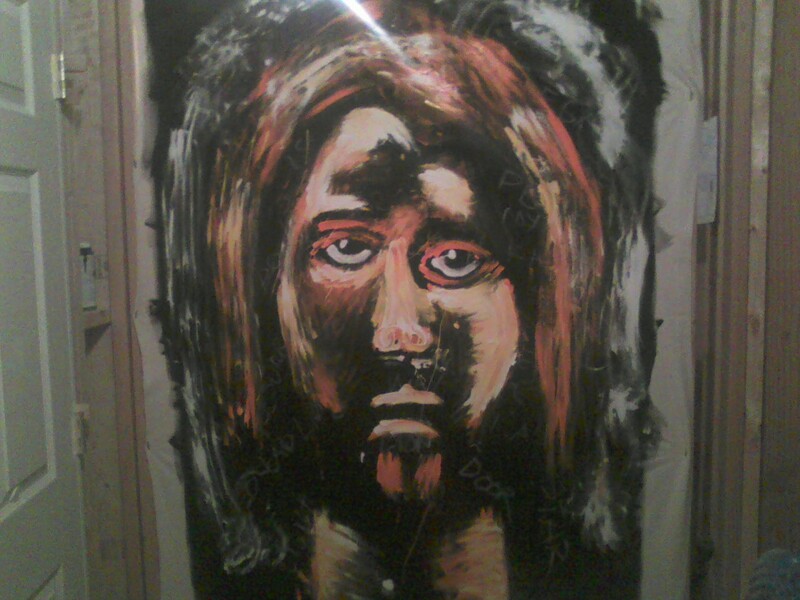 Although I wasn’t overjoyed with how the painting turned out, I was pleased that I had completed my first full-size painting of Jesus. I had now moved on from smaller canvases, so each evening when I came home from work I would need to paint over that mornings painting to make room for a new one. The first time I did this I felt like I was a terrible person. 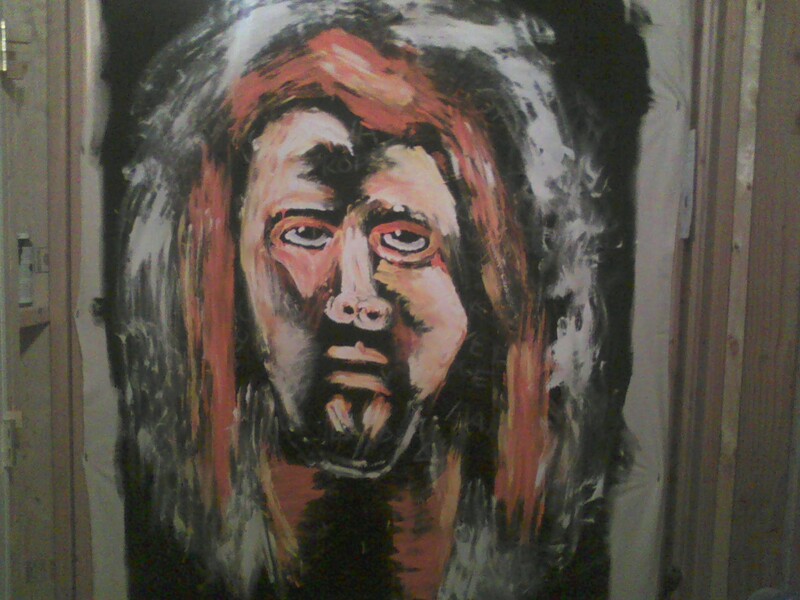 How could I have just painted the face of Jesus? The next morning I woke up early to try again. By the fourth day, I was beginning to feel comfortable with the medium, but quickly realizing that it would be impossible for me to match the speed of the narration on the YouTube video. 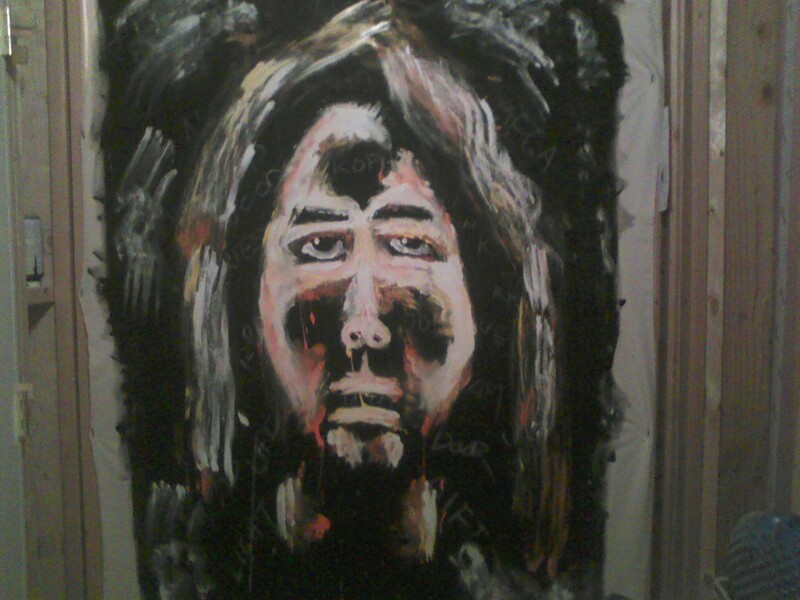 Each morning’s prayer and painting revealed a face of Jesus to me that was just perfect. It was the perfect way to start my day and allowed me to begin my mornings focused on Christ. What a rewarding experience and surreal chance to worship God each morning. In the days leading up to the conference, I built a custom canvas that was stretched on a frame with a stand that could support it on stage. 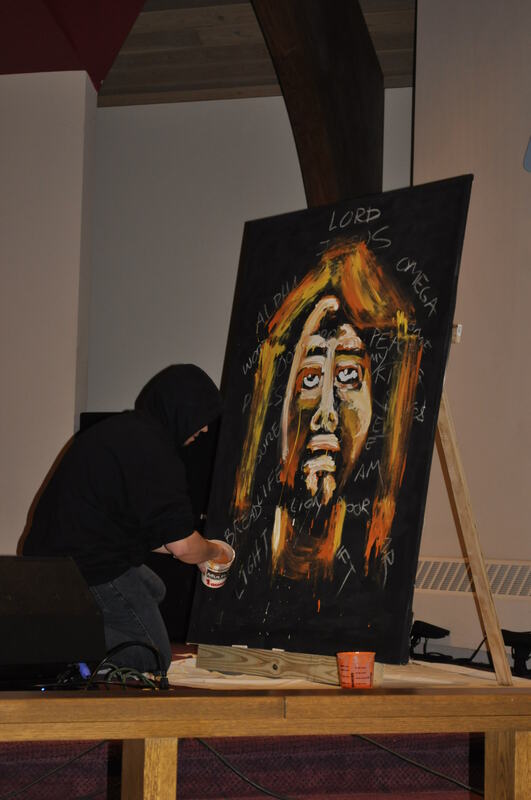 Focused on getting the narration and song timing down, and spent lots of mornings stepping back from a canvas with chills as the song and entire experience of seeing Jesus’ face come to life, to became a truly moving experience. The night of the performance I was a complete nervous wreck. I prayed with Heidi before leaving for the church that God would speak through me that evening and that His name would be gloried through it. I hoped that He would use this opportunity to speak to those in the crowd that were seeking Him. To those who have accepted Christ into the hearts previously, I hoped that it would provide them an opportunity—as it did me each morning—to worship Jesus like never before. 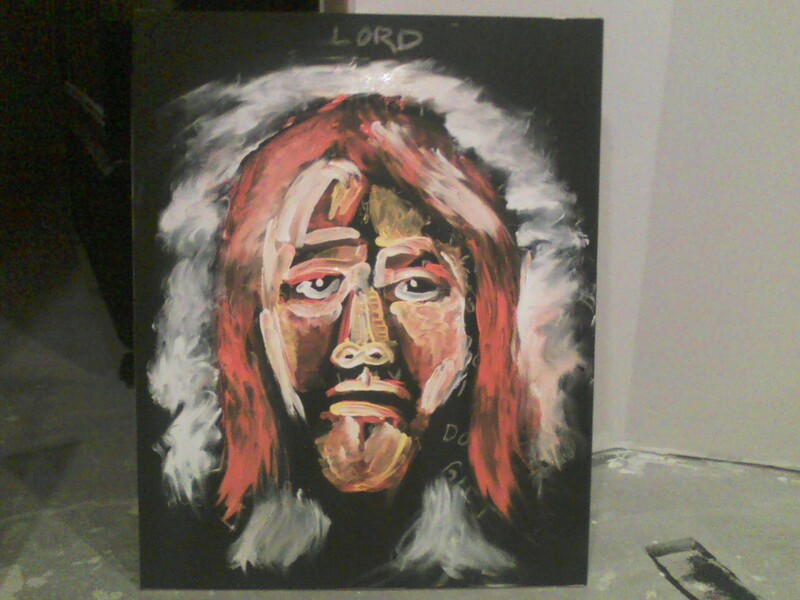 Its odd to explain, as I know that it’s just a painting and it’s not actually Jesus standing before me, but I felt like I was in his presence many days and I hoped that others would share in that experience. 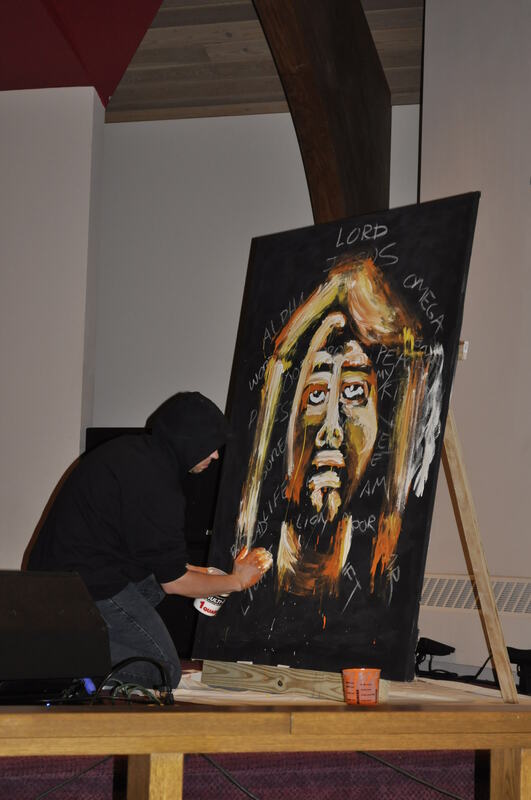 I sat on the front row, nervous, palms sweating and saying one last prayer that Jesus would guide me through this painting just as he had each day leading up the conference. Amazingly, as the moment drew close I felt a peace come over me and a reassurance that “He’s got this one, just like He had the last one”. 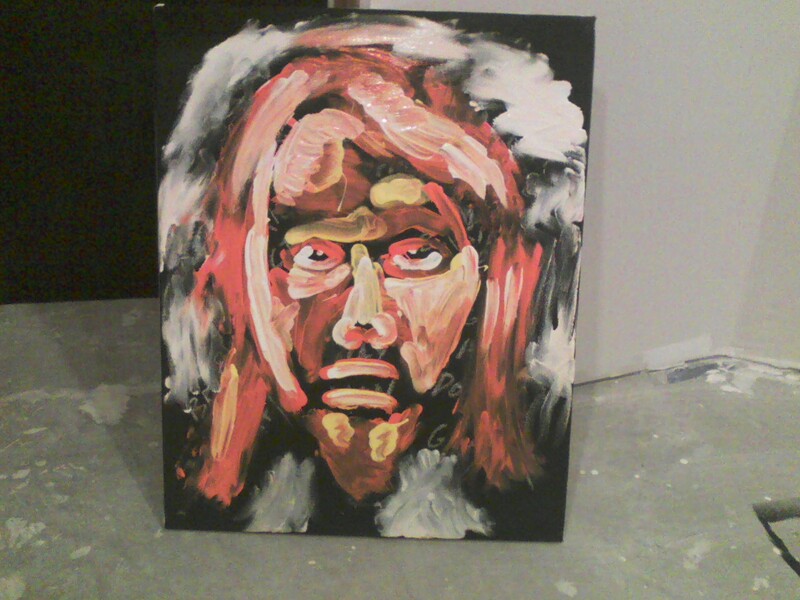 The lighting dimmed, the crowd silenced, and I rose to my feet to walk towards the canvas. Wow! I walked off stage with the largest smile on my face and a sense of accomplishment. I heard the applause as I stood in a dark hallway behind stage and said a quick prayer to thank God for leading me through the performance. I had managed to make it all the way through without messing any of the words up in the narration and smearing any paint where it shouldn’t be. I learned in the 30 days leading up to the performance to trust in God and be patient with His plan. Something He has been working on teaching me for the last several years through our journey. 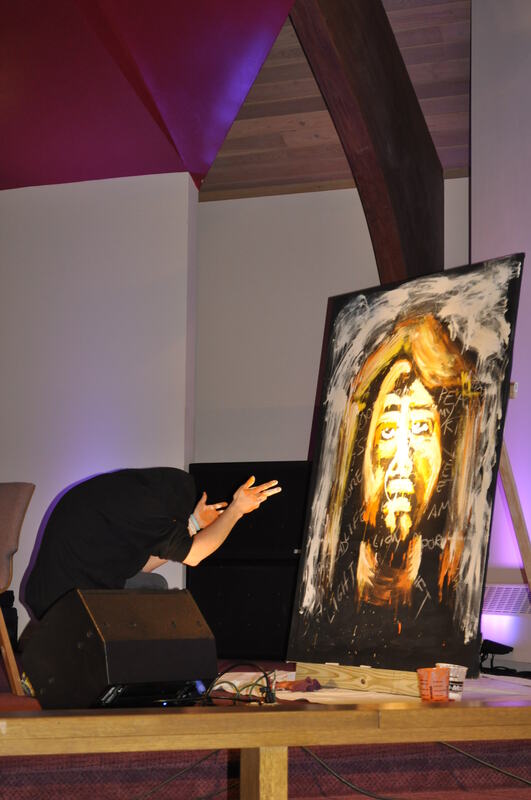 I have received such positive feedback from those who viewed the performance that evening and look forward to finding other ways to offer creative worship to our church for special services. I also found a strengthened relationship with Him through my morning worship time and a renewed passion to take time to each day to focus on worshiping the God who has blessed me beyond belief in my life. 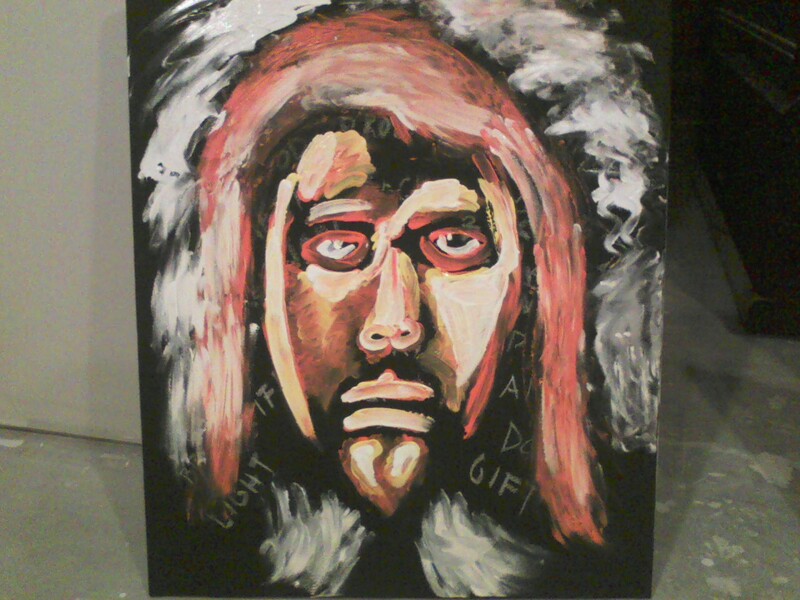 Thanks goes out to those on the committee who trusted and encouraged me through the process of learning this painting, to my wife who helped encourage me each day and provide me creative advice, to those who helped make this possible through transporting my canvas, video projecting my performance, and providing amazing voice over narration. What an awesome experience to take part in and I pray for those who may have been encouraged to try new things, and to trust in the Lord. Each morning I hop in my car and drive to work from Pennsylvania to New Jersey along the I-78 corridor. For those that travel this same route, you know that recently there has been a construction setup that knocks 3 lanes down to 2 lanes, causing traffic jams in the evening while they are working. During the morning commute several workers are present, but the great majority are gone with all 3 lanes open and clear for driving. At the beginning entrance to the construction area flashes a giant lit sign that reads, “55 MPH, Slow Down”, “57 MPH Slow Down”, “56 MPH Slow Down”. 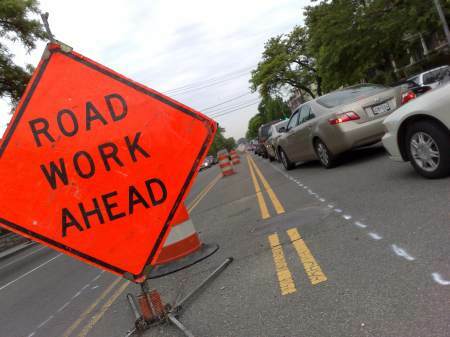 Its purpose is to alert drivers that they are exceeding the 45 MPH speed limit of the construction zone. Each morning, along with 1,000′s of other motorists, I breeze by the sign at an easy 65+ MPH, blending in with traffic and breaking the law. Why do I not slow down?! The sign is giving me a heads up that dangerous road conditions are ahead, that people are working in the area, traffic patterns may be changing. I suppose I do not slow down because most mornings I’m blended in with the crowd of cars surrounding me. Some mornings, I’m running behind schedule and slowing down would be too inconvenient for me—I’ve got places to be. While other mornings, I think it might be dangerous for me to drive 45 mph, because everyone else is going 90! I risk getting hit myself or sticking out from the crowd, being “that guy”. Friday morning during my commute, I got a little help in slowing down while proceeding through the road work area. Shortly after breezing by that sign, there he was. A state trooper with his lights on, nestled in between several of the road cones where there were workers on the side of the road jack hammering up part of the macadam. This is the exact thought that went through my head, and inspired this post. “Mannnnn, why you got to make it so difficult for us. We all knows it’s a construction zone, there’s a large flashing sign to tell us. You can’t expect me to actually go 55 MPH, right?“. Well luckily for me, even though I was doing 62 at the time, there were people on either side of me going much faster and the officer didn’t even budge. After I pumped my breaks and proceeded to slow down until the end of the construction zone, I took the next few minutes of my commute to think about this. I wonder if sometimes we treat God like a State Trooper in a construction zone? The officer in that car is there for a purpose. He’s there to keep others safe and to make sure that the law is fulfilled. When becoming a state trooper, he is sworn under the creed to protect and to serve. Here I am, driving 65 mph, thinking he’s cramping my style. I think about the laws that God provides, and sometimes they aren’t easy to keep either. If we keep God’s commandments, while others around us are breaking them, it’s human to be concerned that others will think you’re “that guy”. The Word says to not worry about the world’s opinion: “If you were of the world, the world would love ⌊you as⌋ its own. However, because you are not of the world, but I have chosen you out of it, the world hates you. ” James 15:19. It is also human to think that if you follow God’s laws that you’ll be missing out on something, but Jesus says otherwise, “15 Do not love the world or the things that belong to the world. If anyone loves the world, love for the Father is not in him. 16 For everything that belongs to the world — the lust of the flesh, the lust of the eyes, and the pride in one’s lifestyle — is not from the Father, but is from the world. 17 And the world with its lust is passing away, but the one who does God’s will remains forever.” 1 John 2:15-17. I consider the laws that God provides and his commandments to be just like that flashing construction sign. It is there to provide direction to safety for motorist and to keep the workers and other drivers in the area protected. God’s laws shouldn’t be viewed as limiting us from life, but instead providing us the true meaning of life. Just like that sign, God’s Word provides a specific look at who we are and what were doing in our life. It provides guidance to get us through life safe to our final destination. “Your word is a lamp for my feet and a light on my path.” Psalm 119:105. Keeping His Word will not always be the popular thing to do. It will sometimes appear that you should go your own speed and ignore the flashing sign, but one day during your normal routine, you may see Him—Heaven’s State Trooper—He was there all along, trying to keep you safe, trying to protect you. You knew you should be keeping His laws, but you choose to go your own speed. Only this time He may not simply let you pass Him by, that day He may be handing out tickets. “I tell you, on the day of judgment people will give account for every careless word they speak” Matthew 12:36. I hope that I can keep this in mind the next time I pass that sign and the next time that I feel torn between what the world says, and what God says. That He’s not there to cramp my style; it’s out of love that he’s there to protect.